With negligent credentialing claims on the rise, the pressure on MSPs and medical staff leaders to reduce legal vulnerabilities in their vetting and governance processes is higher than ever. Negligent Credentialing: Strategies for Reducing Hospital Risk provides the context and strategy necessary to tamp down risk and take appropriate action when good faith efforts fail to prevent litigation. 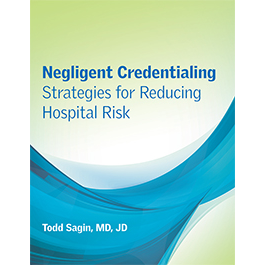 Drawing on his extensive medicolegal background, author Todd Sagin, MD, JD, offers practical guidance, accessible case summaries, and customizable tools for understanding key negligent credentialing concepts, avoiding top pitfalls, and contesting allegations. Todd Sagin, MD, JD, is a physician executive recognized across the nation for his work with hospital boards, medical staffs, and physician organizations. He is the national medical director of Sagin Healthcare Consulting, LLC, and HG Healthcare Consultants, LLC, which provide guidance on a wide range of healthcare issues. He served for more than half a decade as the vice president and national medical director of The Greeley Company, Inc. Dr. Sagin is a practicing family physician and geriatrician who has held executive positions in academic and community hospitals and in organized medicine. He frequently lectures and facilitates retreats on medical staff affairs, physician leadership skills, relationships between hospitals and doctors, strategic healthcare planning, governance, and related topics.